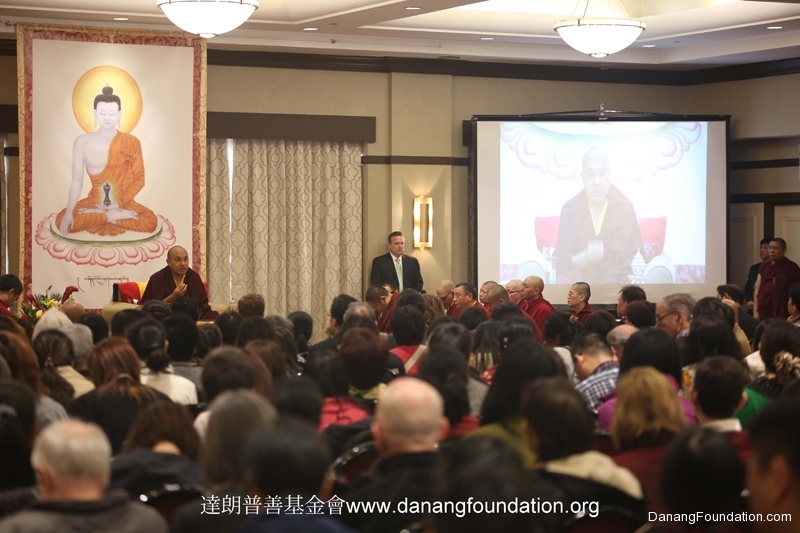 Danang Foundation had invited His Holiness the 17th Gyalwang Karmapa Ogyen Trinley Dorje to grant the teaching on the Four Dharmas of Gampopa and to confer the empowerment of Buddha Akshobhya, which took place between 4/11/2015 to 4/12/2015 at Terrace on the Park, Corona, New York. His Holiness was recognized at 8 years old, by His Holiness the Dalai Lama, to be the reincarnation of the Karmapa, traditionally regarded as the emanation of Avalokiteshvara, and head of the Karma Kagyu tradition. This was His Holiness’ 3rd trip to the United States. Apart from the short stay in New York, His Holiness also visited top universities such as Stanford, Harvard, Princeton and Yale. Besides giving seminars and lectures to students, and academics, His Holiness also received the Chubb Fellowship from Yale University and was granted an honorary doctorate from the University of Redlands. His Holiness also met with disciples and visited monasteries and Buddhist centers. On his first visit in 2008, then Mayor of New York, Michael Bloomberg, declared the day the Karmapa arrived in New York City to be Karmapa Day. 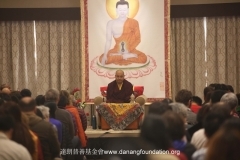 In 2011, His Holiness visited Washington DC to attend the Kalachakra for World Peace empowerment and teachings presided by His Holiness the Dalai Lama. (April 12, 2015, Queens, New York) On his third day in New York, His Holiness came to Flushing Meadow Park, the site of the 1964 New York World’s Fair, whose theme was “Peace through Understanding.” His teaching took place in the circular conference hall of Terrace on the Park, which seemed to float high above the ground like a huge mandala suspended over the meadows. The Karmapa’s throne faced panoramic views that opened out to vistas of the city, an immense globe of stainless steel and the light blue sky beyond. 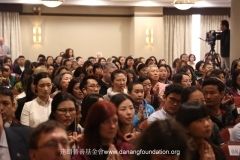 The circular hall was filled to its outer circumference with over 2,000 people, each of whom had received a blue envelope containing a booklet with the daily practice of Akshobhya in Tibetan, Chinese and English. This Buddha was the subject of the morning teachings, which served as a prelude to the Akshobhya empowerment in the afternoon. 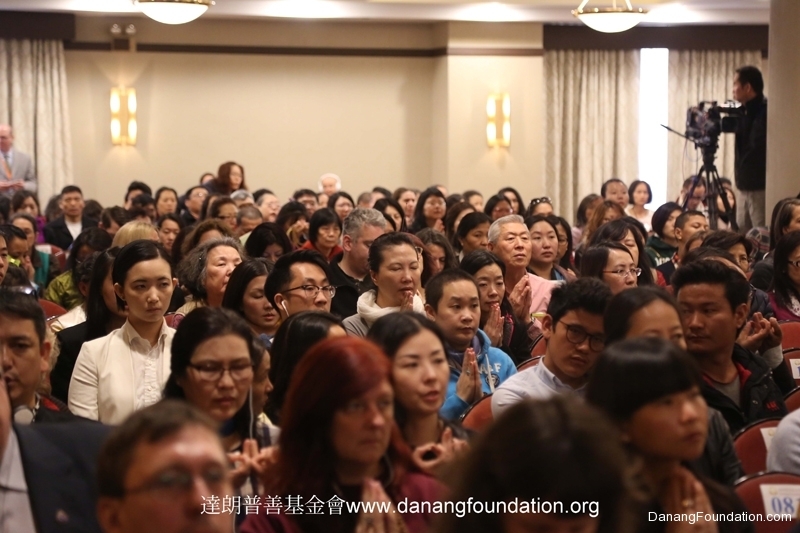 Like the teachings of the previous day, this day’s activities were organized by Danang Foundation. 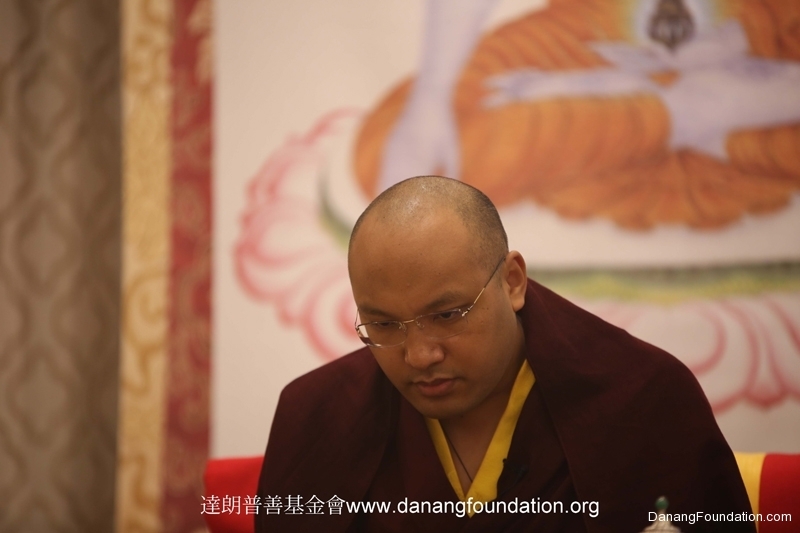 The Karmapa mentioned that he usually encourages the practice of Akshobhya by citing three reasons for doing this practice. The first reason is that “due to technological progress, our actions are thousands of times more powerful than they were in the past to the point that our destruction of the environment and the harm we have done other species is literally inconceivable: we cannot hold it all in our minds.” He gave the example of killing animals, which people have always done, but these days mechanization has increased exponentially the destruction we can do. The number of animals killed in one year for our consumption is virtually inconceivable, he said. We have also caused terrible degradation of the environment. This, therefore, is the first reason for the practice of Akshobhya: the power of our actions and the negative karma we have accumulated. The second reason is that though we are fairly sure we could solve the problems we have created, “our understanding alone is not sufficient to actually make the changes that will enable us to heal the environment. We need to feel these sad situations very strongly in our hearts, which will bring us the resolution to solve the problems.” For this reason, he said, we begin by looking at our minds, for the principle of the Buddha’s teachings is to change and improve them: we should become like Akshobhya who is not disturbed by anger. The wisdom from this long lineage counsels that we should not see Akshobhya and ourselves as separate. “We want to become Akshobhya and that does not mean wearing robes like his and walking around with our hands in his mudra. We want to become the absolute Akshobhya, which is a state of realization and freedom from the agitation caused by the afflictive emotions.” To achieve this, we begin by thinking of ourselves as Akshobhya and embodying his courageous state of mind. 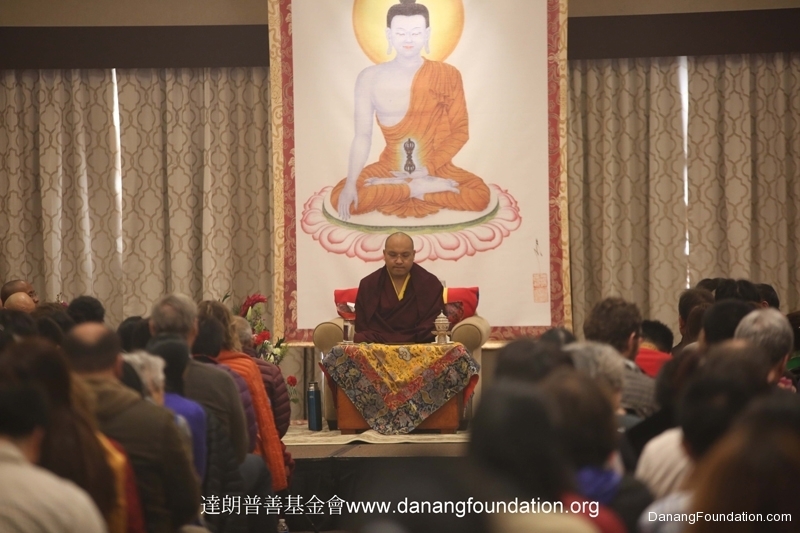 This allows us to develop real positive qualities and that is the real point of practice. 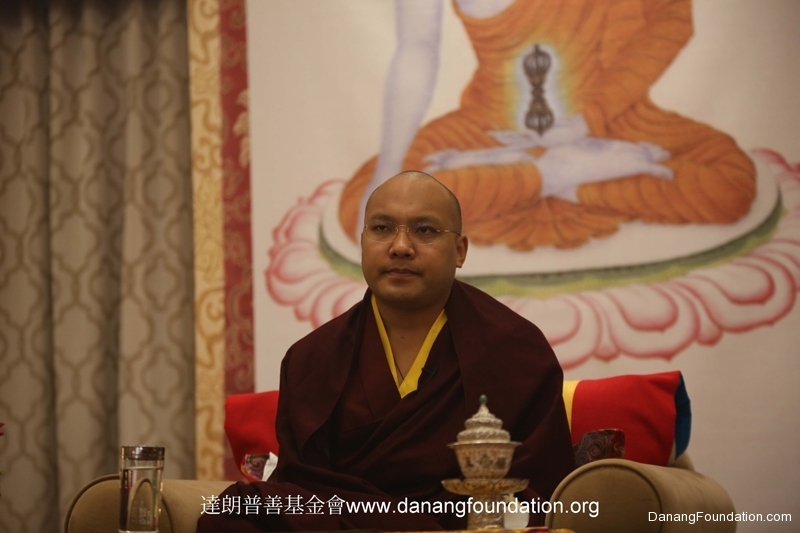 In order that we see how harmful the afflicting emotions are and bid them farewell, the Karmapa encouraged us to develop “amazing qualities” in our mind through practicing Akshobhya. On this positive note, the Karmapa concluded his introduction to the deity for whom he would give the empowerment a few hours later.